A Trip to the Father McKenna Center! A great way to spend a part of the holidays is to volunteer at a community center or soup kitchen, and there are lots of opportunities for service in the area (one of the many things we love about the DMV). The fact that resources and hospitality are so important in Washington, DC and the surrounding areas speaks volumes about our culture here. Those of you who’ve worked with us know our core values – one is that we help others. And we know that we’re often living side by side with people who have serious mental and physical challenges. That’s one of the reasons why we chose to volunteer at the McKenna Center this year. 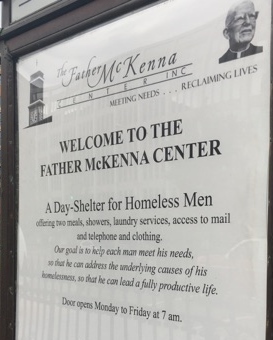 Because the focus of the holiday season should always be about giving and focusing externally; which is exactly what the Father McKenna Center does 365 days a year. The Father McKenna Center, located in northwest Washington DC, was established in 1983. The center has four key programs on which it focuses; 1) a day drop-in center for homeless men; 2) a hypothermia program for homeless men; 3) a food pantry; and 4) an Immersion Service Learning Program to teach students about dealing with homelessness on a relational level. The core values that the McKenna Center espouses surround the belief that everyone is made in the image of God and is worthy of attention, investment, and personal responsibility. By serving at one of the meals, we wanted to be a part of providing a service of some pretty basic necessities. We arrived right on schedule, and we were led through a labyrinth of hallways and door and rooms until we arrived in a small space where we shed our bags and coats and donned hats. There was a crew already working cheerfully in the kitchen who welcomed us warmly and gave us things to do to help prepare for the meal. We assisted with putting the finishing touches on the meal (e.g. dessert) and then took our places behind the growing line of food. Brooke was in charge of bread, plates, and meats; Frank was in charge of the spinach soufflé and assisted with meats; another volunteer was in charge of the soup, and Genesis and Dilvia manned the desserts. It was quite a spread! Soon, the men started moving through the line, gratefully accepting the food provided. Probably twenty or thirty men came through the line and we heard accents from all over the world. Roast beef was the favored sandwich, but all of the food went fast and before we knew it, it was time to wrap up. We had a great time – we may have to make this an annual DKLLP tradition!